Upanishads are verses from the Vedas that have been compiled as independent and complete sets. and his ultimate purpose are termed as Upanishads. Traditionally the verses in each Veda have been classified as Mantra portion or Brahmana portion. Mantra verses are action oriented. Brahmana verses are thinking oriented. Brahmana means planning, discussion and analysis. Aranyaka means research and philosophy. 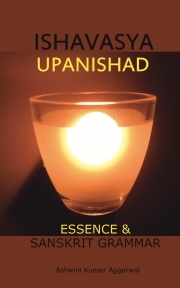 Upanishad means essential thought or teaching or guiding principle. Upanishad verses are those that are found at the end. Thus aptly named Vedanta. Literal meaning ending-portion of the Veda. from verse 1959 onwards, and survives in two recensions, named Kanva and Madhyandina.